My Mom, Lori and her friend Robin made a new blog. 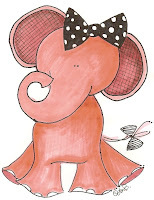 The name of the blog is The Pink Elephant! My Mom drew a really really cute elephant and they named her Ella. 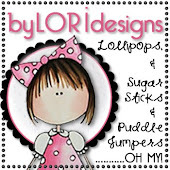 And Robin made an awesome Header, Banners and Watermarks for the blog. My Mom is crazy about Robin's Designs. I know this because she has been talking about this all week!! She is so happy and I am happy for her and her friends. My Mom also told me that I can play along with the challenges, but I can't win any of the prizes. I don't care if I can't win a prize because just getting to join their challenge is enough of a prize!!! I am so happy to show you all my card. Mommy said I put way too much crystal effects on the elephant, but then after it dried she said she really liked it. I hope you all like my card. Hannah I love your card. That embossing on the beautiful pink paper looks great. I think you have done very well with the crystal laquer. Last time I used some of that I put so much on that the colour of my card run and it looked really bad. The card ended up in the bin. your card is great and I'm really pleased you joined in with the challenge. I absolutely love your card. You did a wonderful job on it. 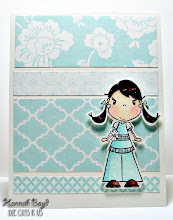 I am very impressed with your cardmaking! Maybe someday you can join our design team! I am glad that your mom is happy with the things I have made for the blog. I think Ella is the best part though!!!! My daughter Shelby (who is 12 too!) is going to enter too maybe, but she won't be eligible for the prizes either. Maybe both of your moms will do something special for you for entering our challenges. Thank you so much for playing along with us. I hope you play each week. Your card is soooo pretty Hannah Bug!! I am very proud of you!! Great card, Hannah. Thank you for the compliment. You're such a sweetie! Hannah you are so talented for such a young girl. My granddaughter is younger than you and loves creating also. I have been creating since I was 5 so keep on being creative. I love your card and Ilove elephants. I think it's wonderful that you share a hobby with your mum! What a talented household! 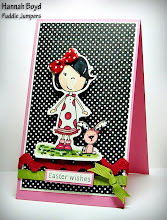 I think that it's a shame that you can't win any of the prizes... this card certainly deserves one! I love elephants Hannah and your card is sooo pretty! your mom is my boss! Hi Hannah! I love your card! Congratulations on your volleyball game! I hope that I get to know you better so we can be best friends! Happy Valentine's Day! Thanks for joining us Hannah!! Your card is so cute! !